নির্ধারিত দিনের দিবাগত রাতে প্রেসিডেন্ট এসে পৌঁছালেন লন্ডনে। পরদিন হাই কমিশনার সকালে গাড়ী পাঠিয়ে দিলেন। পৌঁছালাম তার হোটেল স্যুইটে। ঢুকেই দেখি পায়জামা-পাঞ্জাবী পড়ে জায়নামাজে বসে তসবিহ হাতে ওজিফায় তন্ময় জেনারেল এরশাদ। সামনেই রাখা মাঝারি আকারের একটা কোরআন শরিফ। আমার রুমে প্রবেশের শব্দে উঠে দাড়িয়ে তসবিহ হাতেই এগিয়ে এসে আমাকে জড়িয়ে ধরে উষ্ণ সম্বর্ধনা জানালেন। এখানেই নাস্তা করতে করতে আমরা আলাপ করবো বলেই ADC-কে যথাযথ নির্দেশ দিয়ে তিনি আমাকে নিয়ে বসলেন। বললেন চীন সফরকালে তুমি যা বলেছিলে সেটাই সত্যে পরিণত হল আল্লাহ্‌র অসীম করুণায়। মঞ্জুরের ব্যর্থ সেনা অভ্যুত্থানের পর দেশ পরিচালনার দায় আমার উপরই এসে পড়লো! স্যার, পড়লো না বলে আপনার বলা উচিৎ ছিল দায়-দায়িত্ব আপনাকেই নিতে হল। তুমি হয়তো বা ঠিকই বলছো! তবে ক্ষমতার লোভে নয়, দেশের সার্বিক অবস্থার পরিপ্রেক্ষিতে এ ছাড়া আর কোনও উপায় ছিল না। যাক, বলো কেমন আছ তোমরা সবাই? স্যার, এই সংবাদটা জানাবার জন্যই কি আপনি আমাকে নাস্তা খাওয়ার নিমন্ত্রণ জানিয়ে সাতসকালে ডেকে পাঠিয়েছেন? বাংলাদেশের স্বাধীনতা, সার্বভৌমত্ব, স্থিতিশীলতা, প্রগতি, অর্থনৈতিক সঙ্গতির প্রতি হুমকি হয়ে থাকবে প্রতিবেশি ভারত।স্বনির্ভর দেশ হিসাবে গড়ে ওঠার পথে সবচেয়ে বড় প্রতিবন্ধকতা হচ্ছে ভারত। যতদিন ভারতীয় ইউনিয়ন খণ্ডিত না হয়, ততদিন ভারত চাইবে না এই অঞ্চলের ছোট ছোট স্বাধীন দেশগুলো স্বনির্ভরতার উপর ভিত্তি করে সমৃদ্ধির পথে এগিয়ে যাক। কারণ, তাতে ভারতীয় ইউনিয়নের খণ্ডিতকরণ ত্বরান্বিত হবে। এটাও প্রমাণিত হবে, চলমান বিভিন্ন জাতির জাতীয় মুক্তিসংগ্রামের মাধ্যমে স্বাধীনতা অর্জন করতে পারলে তারাও নিজেদের প্রগতিশীলএবং সমৃদ্ধশালী জাতি এবং রাষ্ট্র হিসাবে প্রতিষ্ঠিত করতে সক্ষমহবে না। আগ্রাসী ভারতের হুমকির মোকাবেলায় ভারসাম্যতার প্রয়োজনেই আমাদের পররাষ্ট্রনীতির মূল হতে হবে গণচীন কেন্দ্রিক, এই কথাটা আপনি ইতিমধ্যেই চৈনিক নেতৃবৃন্দকে বলে এসেছেন। তাই নয় কি স্যার? Gen. Zia’s ego was hurt badly and was unable to take our decision easily. He realized that only the leaders of Sena Parisad and the leaders in exile could expose his real image nationaly amd internationally. Being concerned he ordered Gen. Mahabbat Jan Choudhury one of course mate and close confidant then the DGFI to frame us all in a conspiracy case on the basis of my meetings with my other colleagues and my meetings with different personalities in various sectors while visiting Dhaka. The case should be manufectured as such that being abroad we were engaged in hatching up a conspiracy to overthough Gen. Zia’s government! In this context number of defence personsles were put behind the bars with out any charge sheet. Col. Nurunnobi Khan Bir Bikram who faught with Gen. Zia in the same sector, Col. Didarul Alam Bir Protik, Col. Shahriar Bir Protik, Maj. Huda, Freedom Fighter Munir were among them. Maj. Khairuzzaman who was then functioning as DG in the Foreign Ministry was also put to jail. Very cleaverly, Col. Pasha was called for consultation and got him arrested. They were brutally tortured physically and mentally to secure self confessions. Specially, Col. Pasha was severely tortured and Gen. Mohobbat Jaan Choushury the DGFI could manage him to a state approver. To save the others from inhuman torture Col. Pasha took this decision. But in his confessional statement he only said that the exiled leaders were thinking to establish a political party in the country. Nothing more could be extracted from him. On the basis of that statement Col. Nur Choudhury was re called and Gen. Zia dispatched his DGFI to China with Gen. Zia’s persomal letter of request to convince the Chinese leadership to hand me over to him. Gen The Chinese side refused to do that and Gen. Mahabbat Jan Choudhury had to return empty handed. After this I resigned and left China and went to London. Col. Nur also did the same. Others also resigned and went to different countries of their choice. This is how we became once again scattered rootless refugees but our links remained in tact. Meanwhile, we could see an ominous sign within the armed forces army in particular. Often changes were made to the important posts and positions as desired by Gen. Ershad. Some PSOs were posted out from the AHQ due to difference of openion with Gen. Zia. Even Gen. Manjoor was removed from the post of CGS and sent as the GOC at Chittagong. At this move Gen. Manjoor was furious. He could understand his days were numbered. At that point of time The Indian government and RAW maliciously got Manabendra Larma assanited and installed Shantu Larma as the supreme leader of the ‘Jono Shonghoti Parisad’ and under him intensified insurgeny in the Chittagong Hill Tracts so that the Chittagong Division is brought under pressure forcing Gen. Manjoor to be fully occupied with the counter armed insurgency operations. During Manabendra Larma’s China visit we met as good old friends. He had founded a political platform as a young student leader and freedom fighter called ‘Jana Shonghoti Parishad’ after independence to raise the voice for the legitimate demabds of the backward hilly people. During our meeting Larma said that he expected after 15th August uprising the revolutionary government would change the policy of Sheikh Mujib and would consider favorably the legitimate demands of the backward hilly people for the betterment of their socio-ecomonic deplorable condition. If that was done then they as Bangladeshi citizen would have also stoped their under ground secessionist armed struggle which was imposed upon them as Sheikh Mujib considered the demands to be outrageous and threatened me to stop talking about the demands or else to be prepared to face dyer consequences. He further said that he wanted to see me after 15th August personally to discuss this matter but the situation did not permit due to fast changing scenarios that had evolved around 3ed and 7th November ‘75. Through out Mujib’s erra till that day he was leading under ground life. He also requested me to convey to President Zia that he was willing to talk with him on this matter if he likes. I told him straight that it was not the best time to hold any fruitfull discussion with Gen. Zia. After a few says he was assassinated on his return to the country. After the sad demise of Manabendra Larma at the inistigation of India and RAW, Shantu Larma intensified insurgency to scoop away the Chittagong Hill Tracks from Bangladesh to establish an independent home land for the tribal people. To counter this armed insurgency of Jana Shanghati Parisad Gen. Nasim Bir Bikram and one of his trusted staff officer Col. Helal Morshed dubiously started poting most of the senior freedom fighter officers at the command level to the Chittagong Division with the connivance of Gen. Ershad the Arny Chief. At the same time in every cantonment Gen. Ershad’s henchmen were posted at the command level. President Zia then had no time to look into all such suttle moves. Because, he was then a jet setter roving around the world to enhance his credential as one of the most powerful leader of the 3ed world! To stop the down slide in the worsening law and order situation President Zia removed Gen. Mahabbat Jan Choudhury from the post of DGFI and up lifted him as the Home Minister. Gen Ershad took this oppurtunity and appointed Gen. Mahmud one of his close confidant as the DGFI. While Gen. Zia was flying high the conspiratorial activities was near to its end. In the meantime Soviet Embassy, KGB, Indian High Commission and RAW had already introduced Gen. Ershad with Sheikh Hasina and other powerful leaders of AWAMI-BAKSHALITES, leaders of JSD, Kader Siddiqi and Santu Larma. He was advised to get in touch and develop close tiy at any cost with Peer of Atroshi, Hafez Ji Hujur, Maiz Vandari, Blind(Andha) Hafez, Amani and the Khatib of Baitul Mokarram pretending to be a devout Muslim to get their blessing. This is how it was possible for Gen. Ershad to establish close contacts with all the anti Zia forces outside the cantonments keeping President Zia in total darkness. The officers on whom Gen Ershad depended mainly to hatch up his anti Zia conspiracy were Gen. Chishti, Gen. Mahmud, Gen. Nuruddin, Gen. Mir Shawkat, Gen Mocchu Salam, Gen. Gen Atik, Brig. Nasim, Brig. Rafiq, Brig. Hannan Shah, Brig. Abdul Hafiz, Maj. Munirul Islam Choudhury, Maj. Mozaffar, Maj. Khaled, Capt. Emdad. All of them were then maintaining contact with Gen. Ershad, the Army Chief on regular basis. Gen. Sadek then MS to the President cunningly managed Gen. Zia in a way so that Gen. Zia could have any clue about the conspiracy. On the other hand, Col. Mahfuz then Gen. Zia’s PS being aware of all what Gen. Manjoor was up was not informing Gen. Zia anything about what was going on. Being at London it was possible for Nur and I to know updates on all the developments from various sources. Strangely enough, just before the 1996 election Khaleda Zia’s nominated Army Chief Gen. Nasim attempted a failed Coup De’tat against then the head of the care taker government President Abdur Rahman Bisshwash. Awami Leaguge leader Sheikh Hasina supported his action openly! There after stunning the whole nation dubiously Gen. Nasim and his cohorts instead of being tried for high treason were given Presidential Pardon and just got them retired from the service with all after retirement benefits. Since then they are enjoying their lives comfortably up till now. But on the other hand, ironically five leaders of successful 15th August revolutionary uprising and valiant freedom fighters were sent to the gallows who freed the nation from the yoke of fascist one party regime of tyrant Sheik Mijibur Rahman. The uprising was a sigh of relief and people accepted the political change with spontenuous juvilent support. The revolutionaries were considered as saviors and national heroes. It was they who had flung opened the door closed by BAKSHALITES to re-establish democratic rights of the people to persue multy party politics once again. The door that was opened by them through that BNP, Awami League, Jamaat, Jatiyo Party and all the rest were born or reborn. People got back their individual freedom, freedom of expression and rule of law. The younger generation must understand to establish healthy politics to carry forward the country that the avorsive malicious ugly face of prevailing politics of compromise only for power sake void of any morality and ideology. In 1996, after Hasina’s government came to power even against all the odds in the 21st Book fare(Ekushe Boi Mela) as 3 Edisions my book ‘Ja Dekhechi Ja Bujhechi Ja Korechi’ were sold out within a few days concerned people from the government threatened the publisher not be print any more edision, They also sealed the press. As a result, no more edition of the book could not be published inspite of popular demand of the readers. Even after that the book was clandestinely published translated in English and Urdu. Meanwhile, two web sites www.majordalim.com and www.majordalimbangla.com were removed from the web by Hasina’s government. 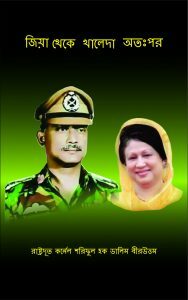 After Khaleda Zia’s government returned to power both the web sites were hoisted again as www.majordalim.net and www.majordalimbangla.net. Those two were also again removed by Hasina’s government after coming to power 2nd time. Without being cowed down both the sites were uploaded again as www.majordalimbu.com and www.majordalimbubangla.com which still some how exist on the web up till now. In 2008 Hasina at the behest of her Indian patrons unleashed country wide reign of terror with ‘Logi Boitha’ to make the way for Gen. Moinuddin Ahmed, the than Army Chief to proclaim rmergency through the President on gun point fpr establishing Fakruddin’s government. Iftekhar Choudhury, a Foreign Service cader officer and Fakruddin’s brother in law of (Younger brother of Pro BNP Enam Choudhury and Pro Awami League Faruk Choudhury) was then posted as the Permanent Representative at the United Nation had connived with the conspiracy playing a immoral and nefarious role. He somehow managed a fake letter from the SG Mr. Ban Ki Moon’s office for Gen. Moin. It was stated in that letter that until the political turmoil in Bangladesh did not get normalized no one from the Bangladesh armed forces would be taken for any UN peace making or keeping missions. This is a lucrative assignment for every members of the armed forces to earn mony. Starting from sepoy to officer every one tries to be selected for such missions even bribing their seniors as after 2 years tenor every one returns with handsome amount and can afford to lead a luxurious life. The armed forces of the poor countries of the 3ed world are considered to be the ‘Spinal Cord’. This is a unique means to polute the moral fiber and destroy the character of this very important institution. This letter helped Gen. Moin to pressurize the President to declare emergency. When the letter became a news the UN SG’s office a statement flatly denied releasing issuance of any such letter. However, nothing was heared from any quarter about this matter and Iftekhar Choudhury continued enjoying his power remaining at his position. The writer had the opportunity to closely obseve and anyalize in depth about the aim and objectives of these missions. Logically it could be said that these peace making and peace keeping missions brought no good to any nation or country anywhere in the world. The benificiaries were the neo-colonial powers economically, politically and geo-strategically and the big financial conglomerates, suppliers and armament producers. Such missions also gave the opputunities to the big powers and their intelligence agencies to select the promising ones as their own pawns to be used as and when required within this vital and most powerful institution of any country. There after, as planned through a stage managed election Awami Leaguge was installed in the power with over two third majority. The Indian adopted son Gen. Ershad joined the Awami combine(Jote) this time as well to save his skin. Most surprising thing was that Menon, Dilip Borua, Innu who are widely known to be dedicated and commited left leaders shamlessly did not hesitate to join Awami Jote and had won the election sailing on the boat of Hasina!In the present political culture void of any ethics or morality it seems everything is Halal(Legitimate). For example, Moudud Ahmed immediately after the demise of Gen. Zia changed his loyality to Gen. Ershad along with few others jumped into the bandwagon of Jatiyo Party. He was awarded the Prime Ministership and later became the Vice President. When Gen. Ershad fell from the grace he again returned to BNP as one of the close advisor of Khaleda Zia! Col. Oli, B. Choudhury, Jomiruddin Sarkar and few others broke away and floated their own political parties but failing to gain any ground had again started coming closer to Khaleda Zia. Bangladesh is realy a strange country as Alexander the great had said! After coming to power the Awami Jote government decided as their first priority to accomplish two objectives with utmost urgency to weaken and break the morale of the armed forces. Immediately after taking the power Hasina promoted two jounior lawyers of her choice to the apex Supreme Court violating the principle of seniority. With these two a five member bench was formed out of which two were Hindus. That bench dismissed the review pititions in a heist and made the way for the government of Hasina to hang brutally the five heros of 15th August revolutionary uprising who all were valiant freedom fighter officers of the army confirming the verdict of death sentence and to be hanged until death violating the laws. After this judicial murder most of the international print and electronic Media and all humanitarian organizations including Amnesty International and Human rights watch etc became very vocal and termed this hanging as ‘Judicial Murder of Hasina’, but any voice of protest of the opposition jote was a far cry rather the government after getting tacit support in their press statements executed the inhuman genocide inside BDR HQ. In that carnage 57/58 brilliant army officers became martyers in the hands of foreign commandos. The members of their families and near ones were savagely molested. More than 200 officers lost their jobs as they raised their voice in furry against this outrageous anti national conspiracy and demanded fair trial from Hasina at the Sena Kunja when she went there to address the angry officers of the armed forces. Hasina was forced to leave the Sena Kunja shaken with fear and embarrassment. The opposition jote under Khaleda Zia on both these important occasion maintained duvious silence and just were on lookers surprising the entire nation! In 2001, the jote under Khaleda Zia, self proclaimed champion of nationalism and religious values came to power with more than two third majority. To restore the caotic law and order the government started an operation with the armed forces along with other law enforcing agencies named ‘Operation Clean Hearts’. Having two third majority Khaleda’s coalition government passed an Indemnity Act in the Parliament give legitimacy to ‘Operation Clean Hearts’. But in 1996 when the government of Sheikh Hasina unconstitunally repealed the Indemnity Act which was part of 5th amendment regarding 15th August and 7th November revolutionary uprisings without two third majority and started a mockery of a trail against the leaders and the heros of those two successful uprisings being charge sheeted for criminal offences, then the opposition jote of Khaleda Zia having more than 120 seats did not protested in the Parliament and just left the House keeping their mouth shut! Even with over two third majority her coalition government did not care to restore that annulled Indemnity Act! This is how Khaleda Zia’s coalition government had endorsed the unconstitutional act of Hasina’s government and felt the way open for the heros to be sent to the gallows. Would it wrong to say that this was a glaring manifestation of politics of compromise? The present and future generation must seriously ponder about this issue. Presently, all the political parties and their leaders might have taken as guerranted that the people of Bangladesh are all hards of cattles and sheeps. They can easily away them at their whims to serve their vested interests. But they forget the fact that the common people can be befooled for some time but not for all the times. When the people raise the issue of corruption of the party leaders and stalwarts, the issue of money launcering they all remain quite. They raise hue and cry about the non issues like the trial of war criminals, sham democracy etc in the public gatherings, meetings and road marches but remain silent about all activities which are against the interest of the nation and the country or shall even provide direct or indirect support to each other if need be to serve the interests of their vested interested groups. Alike the Awami League combine the four party jote of BNP’s duality had created adverse reaction among the countrymen and the members of the patriotic armed forces. This is why mostly now one can hear on the lips of commoners that Sheikh Hasina and Khaleda Zia are two sides of the same coin. Character wise there is also no difference between these two parties. Because of this kind of views, when Khaleda Zia was humiliated and dishonorably evicted from her residence at Shaheed Moinul Road, no reaction could be seen within armed forces. It was not possible for the leaders of Sena Parishad to remain quite and idle when such extremely abominable anti state conspiratorial genocide took place at the BDR HQ. At the initiative of the some exiled fugitive leaders the first Leaflet ‘Wake up countrymen save Bangladesh’(Jago Deshbashi Bachao Bangladesh) and a Documentary CD with facts regarding the killing spree at the BDR HQ was distributed among the people and foreign Media. These were sent through bulk e mail to 5000 IDs around the Globe as well. An open letter was addressed to the PM making her answerable about this conspiratorial carnage. This letter was also circulated among the people as Hand Bill. Though such efforts might appear not to be a big deal, but at that crutial junctire it was not very easy to undertake such responsibilities. Many young activists(Boys and Girls)who were associated with this venture had to face harassment and victimisation in many ways. Not only the writer but the entire nation should be greatful to those patriots respectfully for their courrage and self sacrifices. The young boys and girls who sponteniously came forward to accomplish such difficult undertakings were from the present generation. Therefore, those who suffer from utter despondency with negative thinking and presume that the present generation had become rotten entities. Such presumpssion is absoultely wrong. There is a shimmering spark in the conscience of every youngones’ of present generation. At any critical juncture of the country that spark can create a prairie fire under the tested leadership for the interest of the nation. In that blazing fire the present termited state and social-economic structures could be reduced to ashes in no time alongwith the dancing Dolls and Dollies at the pull of the forien strings attached.